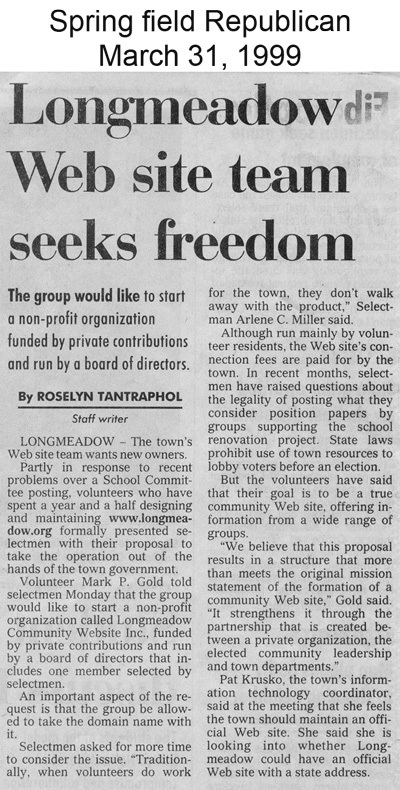 From the beginning, www.longmeadow.org which was created by volunteers in 1997 was designed to be a community based website... not an "official town government" website. In 1997 the domain name for an official town government website in Massachusetts should have been www.longmeadow.ma.us which was a reserved name. Today, cities and towns in Massachusetts use the .gov extension- e.g. http://www.longmeadow.gov/. Such a domain name authenicates the website as an "official government" website since these are reserved names for federal agencies, state governments, cities and towns. For the record there are a few other cities/towns in Massachusetts still using the .org extension for their town websites. Robin Crosbie at the July 12 Select Board meeting suggested to the SB that they consider a name change to the .gov extension. 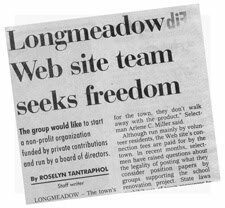 The home page title for www.Longmeadow.org had always been "Welcome to the Town of Longmeadow, Massachusetts". Now the page title reads "The New Official Town Government Website for the Town of Longmeadow, Massachusetts". About 2½ years ago in March 2008, I was interviewed on the LCTV weekly show called Around Town by host Arlene Miller. The discussion included the workings of the town websites including Longmeadow.org and LongmeadowBiz.com and a new entity called the LongmeadowBuzz blog. It is worthwhile to listen to Ms. Miller's personal comments about the value of our town websites- particularly given her skepicism some nine years earlier. Below is a video replay of the interview courtesy of LCTV. In case you missed it, here is Alex Grant's "Payback in Town Politics" that appeared in last week's edition of the Longmeadow News (with permission of the author and thanks to the Longmeadow News). In hindsight, it was probably a mistake for me to censor Jerold Duquette for a specific post relating to Mark Gold's positions given my strong support for his candidacy. However, I felt that Mr. Duquette's unrelenting assault on personal integrity and his lack of respect for dissenting opinion for Mr. Gold and other members of our community demanded that I remove his privileges. As I mentioned on the Buzz in a previous post, I gave Mr. Duquette numerous warnings on prior Buzz posts and I could never trust him to post without monitoring the content. I should have banned his participation on the Buzz after some of his earlier posts. Mr. Duquette had already been banned once on the Longmeadow MassLive forum- something that is pretty difficult to achieve and I was not going to allow his rhetoric to make the Buzz an extension of the MassLive forum. Since last Monday's unprecedented takeover of the town website by the Longmeadow Select Board, the situation has deteriorated significantly with the website currently "under renovation". While I'm obviously not involved with the plans for the "renovated town website" I am confident that the new town website I created at www.LongmeadowMA.org will prosper. I am planning to reallocate a large portion of my volunteer time toward the support, maintenance and upgrade of the Online Storrs Library (http://www.longmeadowma.org/library/index.html) which I helped create over the past 13 years. Given the ugly rhetoric against NO supporters that occurred during the high school building project, I would not be surprised to see some strongly worded rebuttal "letters to the editor" of Alex Grant's opinion column in upcoming issues of the Longmeadow News and The Reminder. This controversy about the website is about OPEN and TRANSPARENT government not a continuation of the School Building Project debate.